Installing seals in fluid system ports is critical to the engine manufacturing process. Choosing the right seal can streamline production, save time and money, and maximize system reliability. 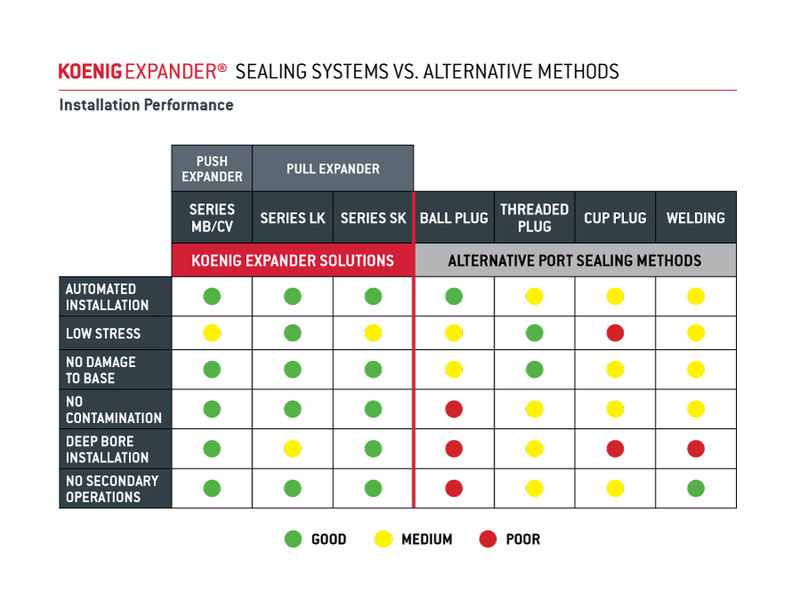 Today, advanced technologies such as the KOENIG EXPANDER® offer distinct advantages in installation performance versus traditional sealing methods, especially in modern production environments. KOENIG EXPANDER® plugs are available in a variety of sizes and materials, in both push and pull types, and are proven reliable in metal-to-metal seal applications. These engineered solutions outperform many traditional sealing methods. 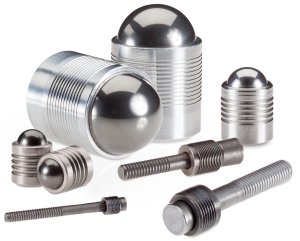 Traditional port sealing methods include ball plugs (a metal ball pressed into the port opening), set screws/threaded plugs (tapped and threaded into the port sometimes with an additional sealant applied), cup/freeze plugs (pressed and/or chemically bonded in place), and welding. While often selected for their low per-piece cost, these simple sealing options have distinct disadvantages in modern engine designs and high-speed production lines, which often increases total costs and results in errors. 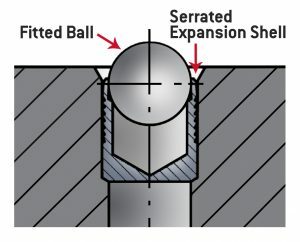 During installation, controlled forces are applied to a fitted ball or mandrel which expands the serrated shell of a KOENIG EXPANDER®. This creates a secure metal-to-metal seal without the need for sealant or additional machining. Engineered sealing solutions, such as the metal-to-metal expander seal design of SFC KOENIG® products, are rapidly becoming the preferred solution for precision applications. KOENIG EXPANDER® seals feature a serrated metal sleeve that is expanded radially by an integrated metal ball (push-type expander) or mandrel (pull-type expander). On installation, the sleeve’s serrations press against the port wall forming a leak-proof seal with uniform pressures, even in thin wall applications, with no sealant required. As engineers improve the efficiency and performance of modern engines, new design challenges arise. Thin port walls and lightweight metal alloys are challenging for simple sealing solutions, as their installation can cause detriment to the base housing. From heat deformation created during the welding process to deformation created by installation forces, traditional methods pose a variety of concerns. Comparatively, engineered solutions such as the KOENIG EXPANDER® effectively solve many installation concerns – reducing installation stresses, reducing contamination from sealant or machining processes, and allowing for installation in unique locations, such as thin walls and deep in ports. Installation performance of KOENIG EXPANDER® sealing systems verses traditional port sealing methods. The need for sealing solutions to support automated production lines is rapidly increasing with the integration of IOT and smart factories. Modern production environments, coupled with precision engine design, require calibration, control and compliance. Engineered sealing technologies, such as the KOENIG EXPANDER®, are quickly becoming the preferred solution for today’s manufacturers. Find out more at www.sfckoenig.com.